Nestled in a peaceful, wooded area of Saddlebrook in St. Lazare, Evergreen Elementary offers a 50/50 Bilingual program where children learn both official languages. We are a vibrant community school where a dedicated and caring staff is committed to academic achievement, bilingualism, computer literacy, and a sense of community responsibility. Evergreen is home to a beautiful well-stocked library, an old-fashioned "double gym" and an amazing music room. In addition, it has embraced advancements in technology by equipping every classroom, including Daycare, with a Smartboard, and by initiating the iPad One-on-One program. To further enrich its offering, Evergreen also has a mobile iPad unit as well as iPods to be used in learning centres at all grade levels including Kindergarten! 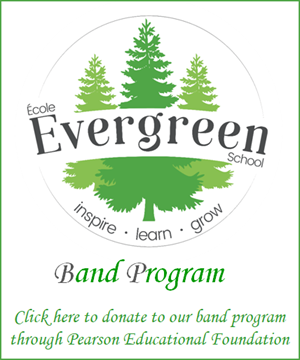 Evergreen is a proactive school and that is evident by the many programs it offers. Evergreen also prides itself in encouraging students to help students through its Mentoring program which includes a shared reading program, bus and recess buddies and the Peace Pals. No school is complete without a Home and School Association, and Evergreen is very fortunate to have a group of compassionate and dedicated volunteer parents who work to enrich our school in countless ways. If you are looking for an elementary school that inspires minds and builds futures, look no further than Evergreen Elementary!